Candy filled pumpkins would be a perfect Halloween gift for kids. Each plastic pumpkin is pre filled with 1 piece of individually wrapped candy. The variety varies you may find gumballs, sweet tarts, candy bones, witch's warts and more. If you were planning a party these pumpkins would make great party favors. You could hide them and have a pumpkin hunt, as we know how much kids enjoy egg hunts. 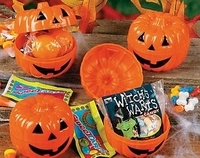 Each plastic pumpkin is about 2" and is hinged on one side; you could actually use them over and over again. 24 per bag.